"Mrs. Kim, I..." Jonghyun trailed off as he started to panic, unable to find the right words to explain what was going on. "No, I would like to speak first," she interrupted, standing up from her spot on the armchair and making her way over to where Jonghyun was seated on the sofa. Jonghyun wasn&apos;t sure what to expect; he hadn&apos;t yet denied being involved with Key, and the truth was, he didn&apos;t want to lie about it. Lying would only be digging himself a deeper hole. He wasn&apos;t sure how he was going to get himself out of this mess in the first place. "I&apos;ve known you for a long time, Jonghyun," she said, with absolutely no hints as to how she was feeling in her tone, "but I&apos;m not sure if this is what&apos;s best for my boy. Or yourself, for that matter," she added, clearing her throat. "I want my Key to be happy, but--"
"I can make him happy!" Jonghyun exclaimed, tears coming to his eyes. He hoped he hadn&apos;t said that loud enough for Key to hear. If Key&apos;s mother didn&apos;t approve of their relationship, then there was nothing he could do. Mrs. Kim was like a second mother to him, and he wouldn&apos;t be with Key behind her back, not ever. "Let me finish, Jonghyun," she said sternly, crossing her arms over her chest. Jonghyun bowed his head in an apology. "Key obviously cares for you a great deal - he always had looked up to you - but I never imagined him to be..." Her eyes darted around the room as if she was embarrassed. "Well, gay." She whispered the last word with wide eyes. She sighed, holding her hand over her face in dismay. As much as he hated himself for saying it, Jonghyun had to. There was no other option, and he had to do the right thing. This was the right thing, he told himself over and over again, but it didn&apos;t make it any less difficult. "I&apos;ll end it." He felt his heart break. Perhaps coming along today had been a mistake. "Hey, Mum!" Key called from the kitchen. "Where&apos;s the milk?" Mrs. Kim sighed, retreating to the kitchen as she muttered to herself. "Blind as a bat, he is." Jonghyun was left in the sitting room, awkwardly staring at his feet and trying not to burst into tears. He could hear his heart thudding in his chest - loudly. She hadn&apos;t even given him a straight answer, she hadn&apos;t told him exactly what he was supposed to do about the situation. Jonghyun wasn&apos;t sure if he wanted to hear her opinion. He wanted to be with Key but somehow he knew this was only going to end badly. Key returned with his face lit up with a bright smile, carrying a tray of mugs with his mother close behind. He placed the tray on the coffee table, grabbing his mug before taking his place next to Jonghyun on the sofa. Jonghyun shifted over an inch or two on impulse, which earned him an odd look from both Key and his mother. "Yahh, thanks," he said as Key handed him his own tea. Steam was rising off it, making him feel impossibly overheated. He was too nervous to be near Key now, that was for sure. "Key, can you grab the biscuits for me, please?" Mrs. Kim said and Key happily obliged, trying to ignore Jonghyun&apos;s strange behaviour as he made his way into the kitchen. "I see the way he looks as you," Mrs. Kim stated out of nowhere once Key had disappeared yet again. Jonghyun stayed silent, though a frown appeared on his face. Mrs. Kim shook her head. "He&apos;s falling fast for you - too fast. You have to catch him before he hurts himself." Mrs. Kim sighed deeply before continuing. "He&apos;s like glass. And do you know what happens to glass when you drop it, Jonghyun?" "It breaks," Jonghyun said, as if the answer was obvious. "And what happens if you try to glue the pieces back together again and fill it with water?" she proceeded to ask. "The water would just seep through," he said, inevitably. "Yes. If you break him... I&apos;m scared he&apos;ll never be happy again." Mrs. Kim sighed and Jonghyun nodded with a look that told her he understood. And he did understand. He would never break Key. They had been through so much together; Jonghyun knew he would be lost without Key. Key needed him, and he needed Key - and that&apos;s all that mattered. The rest of the morning Jonghyun sat in silence, listening to Key talk to his mother about the show in Japan, and how Minho had to stay behind. He spared no detail - none except for what Taemin had done with Jonghyun. And thankfully, she hadn&apos;t heard about it, or if she had, she decided not to bring it up. "Are you okay?" 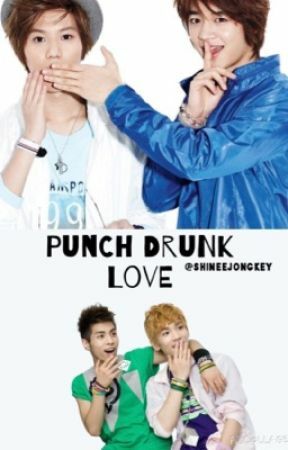 Key whispered, leaning over to Jonghyun. His mother had left the room for a moment to pick up the phone which had begun to ring. "You haven&apos;t said anything since I came back into the room." Jonghyun simply shrugged, unsure of how to approach Key anymore. The look Key gave him told him that he had hurt his feelings, which only made Jonghyun feel even worse. Mostly, he was just angry at Key&apos;s mum for not being clear with her words. Mrs. Kim returned with a small frown on her face. "I&apos;m sorry, kids, but I have to leave. I&apos;ve been called into work." She walked over to Key and gave him a kiss on the cheek. "It was nice seeing you," she nodded at Jonghyun. She followed them out to the door, saying goodbye once more. Key started down the steps, but before Jonghyun could follow, she grabbed his arm and spun him around with a sad smile on her face. "As I said, I just want him to be happy. And he&apos;s his happiest when he&apos;s with you. Please don&apos;t do anything to hurt him," she said, glancing over Jonghyun&apos;s shoulder to look at Key who was still making his way over to the car. "I won&apos;t. I would never - I couldn&apos;t," Jonghyun stammered, trying to hold back a grin. All his previous worries disappeared as he hugged Mrs. Kim tightly, thanking her over and over again. "I love him. I&apos;ll keep him safe," he whispered as he pulled away. He said goodbye once more before chasing after Key to the car, waving at Mrs. Kim as she closed the front door. He had her approval, and that was all he wanted.